The figure used for this unit is a Heroclix figure from the Icons set. Its model number and name are #019-021 / Blackfire. Character Bio - As the first child of Queen Luand'r & King Myand'r of Tamaran, Princess Komand'r was supposed to inherit the throne. However she suffered a childhood illness that left her unable to absorb ultraviolet radiation to fly as most Tamaraneans and was deemed unfit to inherit the throne. Komand'r's younger sister, Princess Koriand'r (later known as Starfire) was named heir to the throne which triggered a lifelong rivalry between the sisters. When they were about nine years of age, the sisters were sent to the Warlords of Okaara to be trained in the martial arts. Besting her sister in battle, Koriand'r cemented the hatred of Komand'r - prompting her to attempt murder against her sibling. Expelled by the Warlords of Okaara, Komand'r allied herself with the Citadel, aiding them in breaking through Tamaran's defenses. As part of the treaty that followed, Koriand'r was surrendered to the Citadel and enslaved by Komand'r. In captivity, Koriand'r was tortured and humiliated for six years before she, and her sister, were captured by Psions, a race known for their cold-blooded dedication to scientific experimentation. The Psions conducted experiments to determine the Tamaraneans' maximum abilities to absorb solar energy. During the experiment the Citadel retaliated against the Psions. The Psions fled and the sisters were left to die. The experiment backfired giving Koriand'r the ability to project solar energy through her hands as Starbolts. She used this ability to free her sister and was rewarded with betrayal and imprisonment. 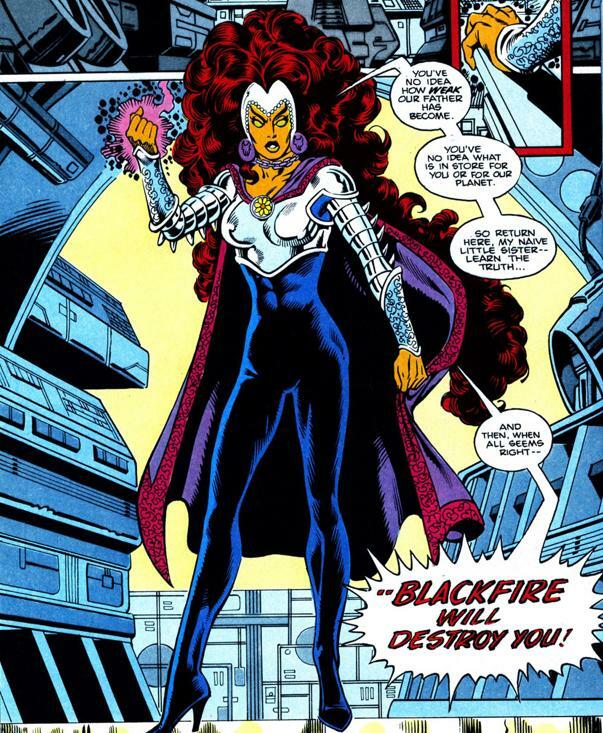 Komand'r also developed an ability to focus solar power into dark Starbolts, becoming the warrior known as Blackfire. Last edited by Ronin; October 9th, 2017 at 08:56 PM. After Blackfire attacks the first time on a turn with her normal attack, she may attack up to 2 additional times with her normal attack if there are 3 or more Wounds Markers on this card or if there is at least 1 opponent's Tamaranean figure within 4 clear sight spaces of Blackfire. If Blackfire inflicts one or more wounds with this special attack, immediately roll 1 unblockable attack die against each figure that does not have the Super Strength special power adjacent to the defending figure. 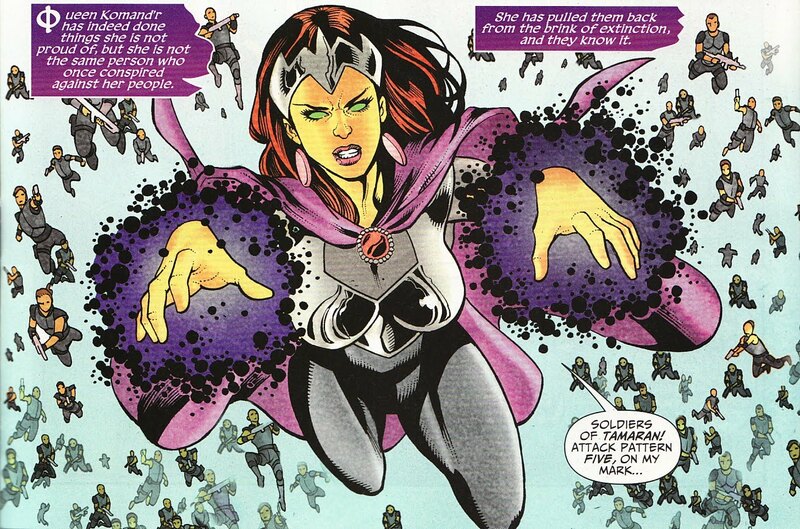 When Blackfire attacks with this special attack, she may attack one additional time with this special attack. Last edited by A3n; March 13th, 2016 at 05:00 AM. Looks good to me. Tamaranean Hatred is fun, helps nail the theme without making her too niche. I find it a BIT odd that Dual Starbolt can hit four figures... just name-wise. Starbolt Barrage or something would clear that up, but it's might just be me, so take the suggestion with a grain of salt. And I assume you're using the older, 25 cent figure and not the new $30+ one? The dual is for the 2 attacks. the fact that 1 attack can hit 2 figures is just the explosive effect of a starbolt. Yes, absolutely. In fact I will put those details in now. I'm a little confused by the theme of Tamaranean Hatred. I get why she goes berserk if she's wounded, but it seems weird that she could choose an enemy Tamaranean to get the additional attacks, but then just attack a different figure. Looks solid to me. Starfire can be insane at times with her mutliple attacks, but without the Titan synergy and Reckless Engagement, Blackfire should be more balanced. 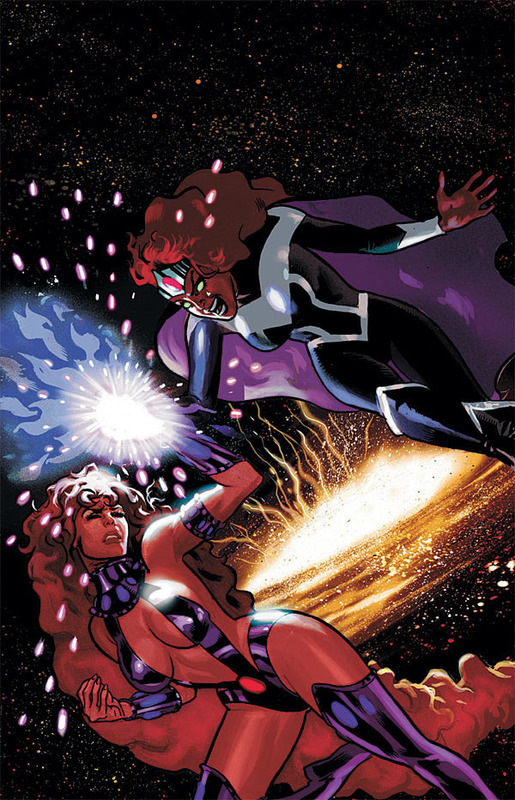 Before attacking with Blackfire, you may choose either Blackfire or an opponent's Tamaranean within 4 clear sight spaces of Blackfire. After Blackfire attacks with her normal attack, she may attack one additional time for each Wound Marker on the chosen figure's Army Card, up to a maximum of two additional attacks in a single turn, or three additional attacks if the chosen figure is a Tamaranean. I did have a power that was more against Tamaraneans but was talked out of that because it was too niche & this is more in-line with her sisters power. I now see this as because there is a Tamaranean on the opponents army that angers her & fuels her hatred. I am not opposed to that, except that Blackfire should be more ruthless than Starfire, so the dropping down to 2 attacks for anybody is kind of a bit watery compared to Starfire. I suppose I am hoping that Blackfire will come out about the same cost as Starfire even though Starfire has the ability to Fly. If it helps, I think Starfire is undercosted/should be limited to 2 extra attacks. I'm good either way here though. I get the theme, but personally it doesn't come through with the current power. I think what doesn't work for me is the fact that it's based on wounds, which just comes off weird when she chooses an enemy. What about doing it like this? Blackfire adds 1 to her Attack number when attacking a Tamaranean figure. After attacking with Blackfire's normal attack, you may attack with Blackfire's normal attack one additional time for each Wound Marker on this card, up to a maximum of two additional attacks in a single turn. I see it as schadenfreude, personally. "There is nothing more invigorating than seeing you in pain, sister!" Stuff like that. I think it works fine as drafted. We could call it Tamaranean Anguish. I think that would better convey both choosing herself or an opponents Tamaranean. So what is the consensus on the actual power dropping to 2/3 additional attacks? Before attacking with Blackfire, if there are two or more wound markers on this card or opponent's Tamaranean figure is within 4 clear sight spaces of Blackfire. After Blackfire attacks with her normal attack, she may attack two additional times, or three additional attacks if she is attacking a Tamaranean. After attacking a figure with this special attack, if you inflicted one or more wounds on the defending figure, roll one unblockable attack die against each adjacent figure without the Super Strength special power. After attacking with this special attack, you may attack one additional time with this special attack.